Liquid Taeja takes his second DreamHack Champion title with a decisive 3-0 win over INnoVation. The StarCraft II tournament finals at this past weekend's DreamHack Open Bucharest pitted Terran against Terran in a series of nail-biting games. Liquid Taeja's win makes him the second player, after teammate Liquid HerO, to win two DreamHack Champion titles. The first place finish comes with a prize of 60,000 Swedish Krona, or about $9,200 USD, and qualification for the Grand Finals at DreamHack Winter 2013. 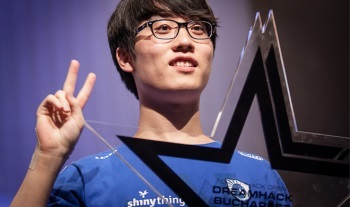 Taeja had previously qualified for the Grand Finals at the DreamHack Open: Summer tournament, so the qualification went to the 5th place player, Woongjin sOs. The favorite to take the tournament was INnoVation, who is currently the top ranked player under the World Championship Series (WCS), a tournament series organized by StarCraft creators Blizzard Entertainment. INnoVation made quick work of his opponents, losing only a single game between the round of 16 and the finals (the round of 16 begins when the original pool of 96 players has been whittled down to just 16 fierce competitors). That single loss was to MMA, another Terran player and a veteran of professional StarCraft. Taeja's path from the round of 16 to the finals was similarly impressive, defeating his opponents YugiOh, sOs, and Life without a loss. Each game in the finals was a narrow victory for Taeja, but he managed to take the series in three consecutive wins. The DreamHack Open consists of five events held yearly across Europe. Each tournament sees 96 StarCraft II players compete for prize money, qualifying points for the WCS, and four qualifications for the Grand Finals at 2013 DreamHack Open: Winter tournament. The tournament format begins with round-robin group stages, progressing to a single-elimination bracket for the round of 16 and beyond.